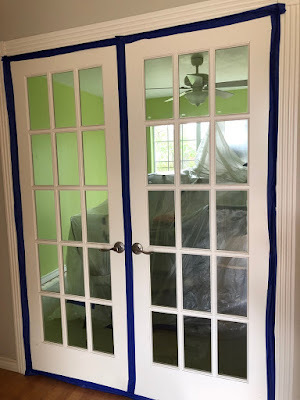 Sealed up to prevent most of the construction dust from permeating everything - felt a bit like a "cooking" scene from Breaking Bad was happening over here. 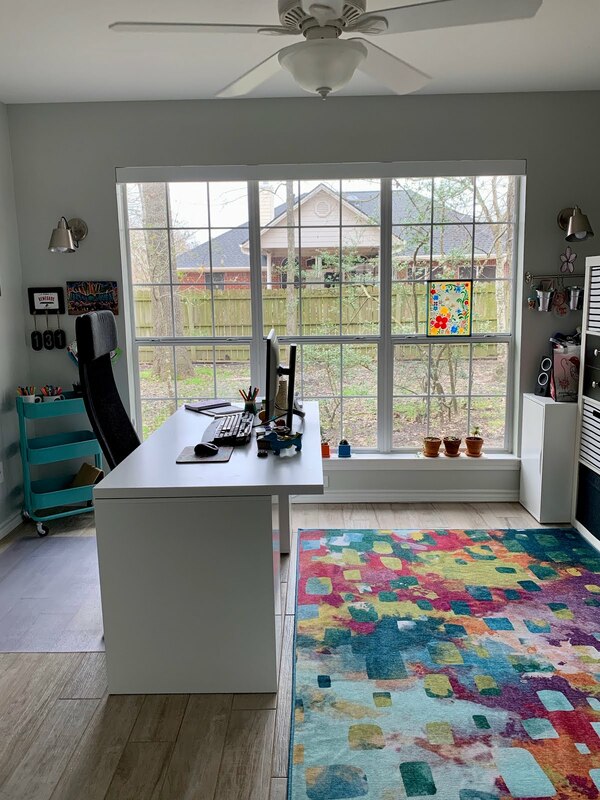 Mostly the plans for my office were to remove the French doors and fill in the areas where the hinges were, paint it the same color as the rest of the house, and get new tile flooring in there so the entire area would look more cohesive. And that's pretty much what we did, although I did have the sconces on either side of the windows switched out - I went from soft uplighting that did not help one bit for old blindy here to see when it was dark, to really cool downlights with daylight LED bulbs and holy moly, I'm not as blind as I thought I was! I don't know why it never occurred to me to make that change, oh I don't know...10 years ago? Instead I tried all kinds of desk lamps and never got it quite right. Sometimes the solution is right there, but you just don't see it - because it was too dark, HAHA. Onto the pictures - hopefully I've covered everything in the captions, but if you have any questions, feel free to ask. 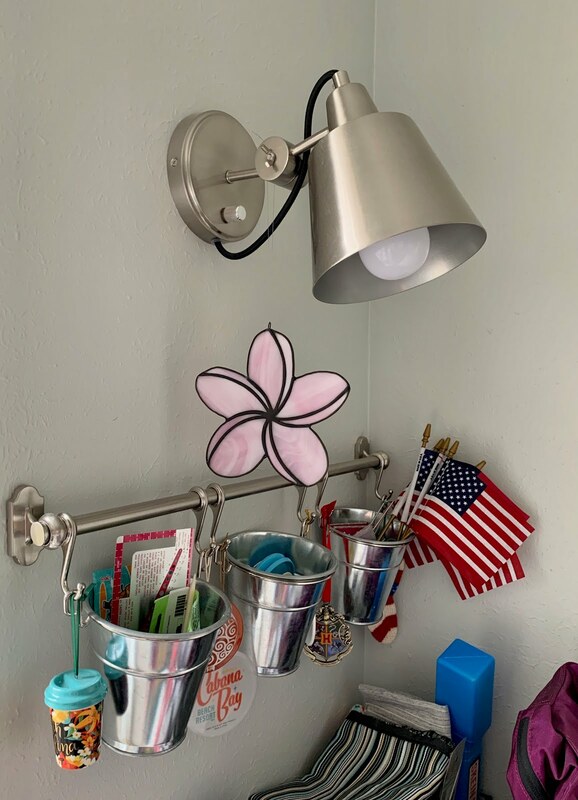 While I loved the bright lime green walls, I equally love the gray - and it makes for a nice background for all of the colorful items in my office. 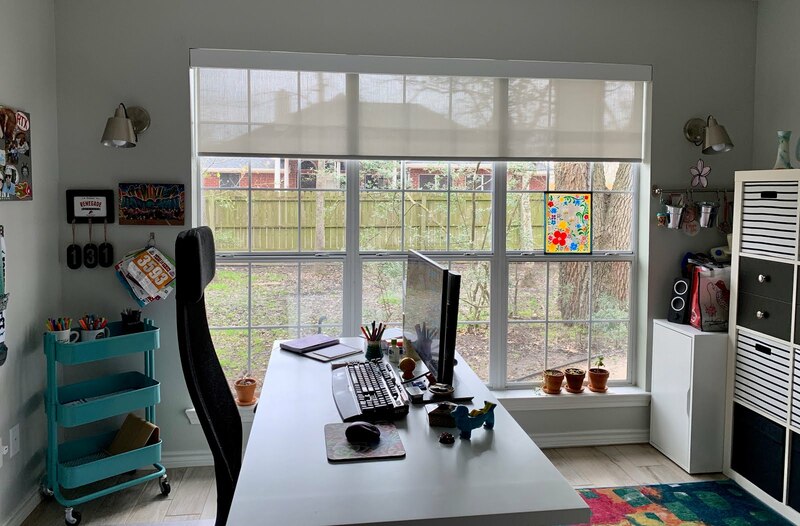 Also, please note the roller shade in this picture - this is what I recently had installed and it's made all the difference in being able to stand being in my office during the harsh winter months - the sun coming in was so bright that it was impossible to sit at my desk without shading my eyes. Because the tile makes for an echo-y room, I needed an area rug and of course I went for something colorful. 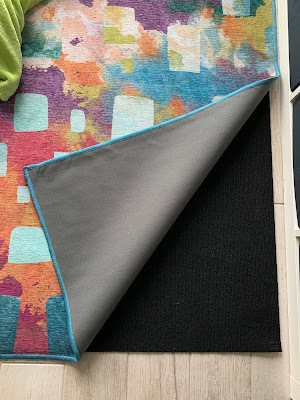 I tried out a brand - Ruggable - that intrigued me because you can wash this in your standard washing machine...and for someone who bought the rug knowing it was a sure bet that both Paco and Henry would barf on it at some point, I liked that concept. 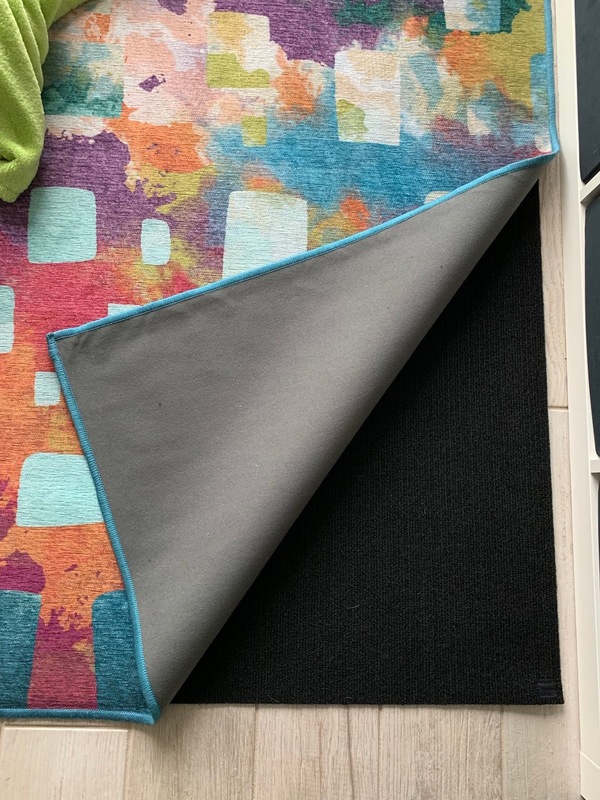 It has a velcro-like pad that the rug adheres to, and when you want to wash it, you remove it from the pad and throw it in the washer. 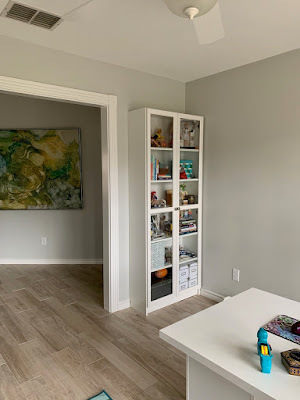 I'm glad I tried this out in my office first, as I was thinking about getting one for our family room as well; however there's really no cushion at all to the pad and there's not much of a difference, comfort-wise, in walking on this vs walking on tile. Also, vacuuming it with my Dyson is a challenge; even on the lightest suction, it wants to shift around. Still, I do like it for this area. New sconce - I got the pair from Amazon but they aren't available at the moment. It is the Possini Euro Capetown brushed nickel 8" sconce if you want to search for it. 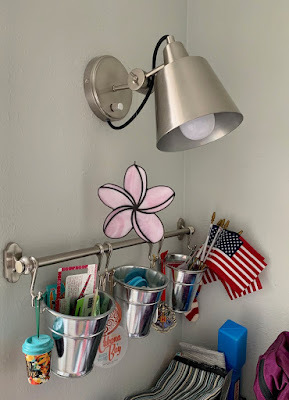 I really love these sconces! Funny thing - I liked the tree painting on the green wall, and I like it on the gray wall as well. 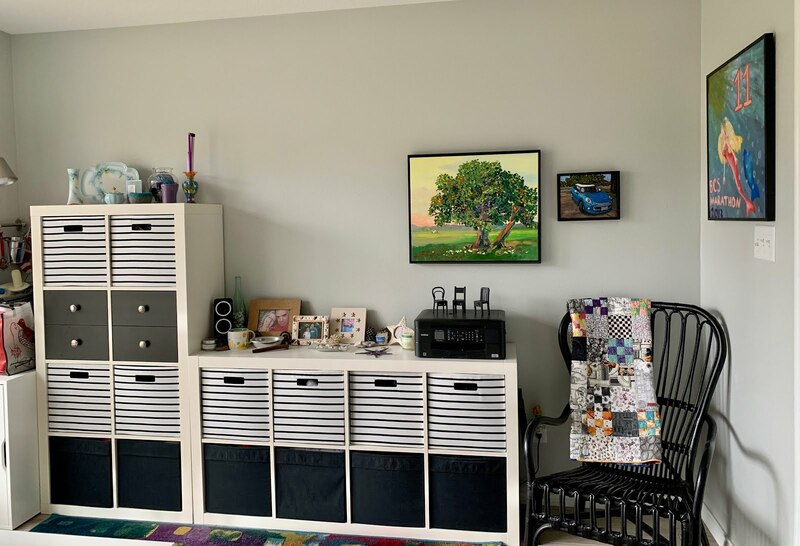 I moved some things around and yes, there's a hole where another painting/picture can go...when I come across the perfect, meaningful piece, I'll fill that spot. In the meantime I'm willing to wait; everything on my walls has either come from someone I know (the tree was painted for me as a gift by an artist I was friends with back in my Arts Council days, and the car was commissioned by Jeff for my birthday, painted by a former coworker who is also an artist), or is from something important (the mermaid with the 11 is a mile marker from a half marathon I ran - the organization sold the mile markers after the race to raise money for charity). Also the quilt on the chair used to be hanging behind my desk; my friend Debby made it for me and I love it no matter where it is (but now I can use it when I'm sitting here and my legs get cold). Changed things up - it's a little less busy behind the desk now. I moved the wrought iron baker's rack that was in this spot back into the kitchen, and bought this white bookcase with doors at Ikea. 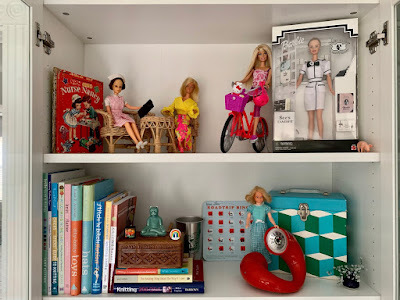 I like the doors because it keeps most of the dust off of my treasures, but the wood frame around the glass hides what is on the center of each shelf, so I had to arrange things toward each side to accommodate that space issue. 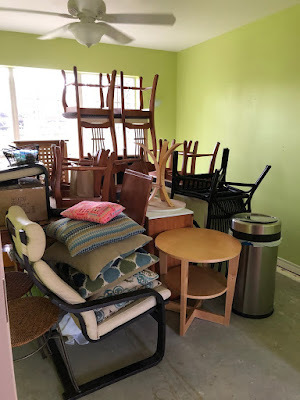 And with this post, I happily conclude our house renovation reveals. It's amazing to me to see how much our house has changed in less than a year; we still love everything and are so, so pleased with how fresh and new it looks. 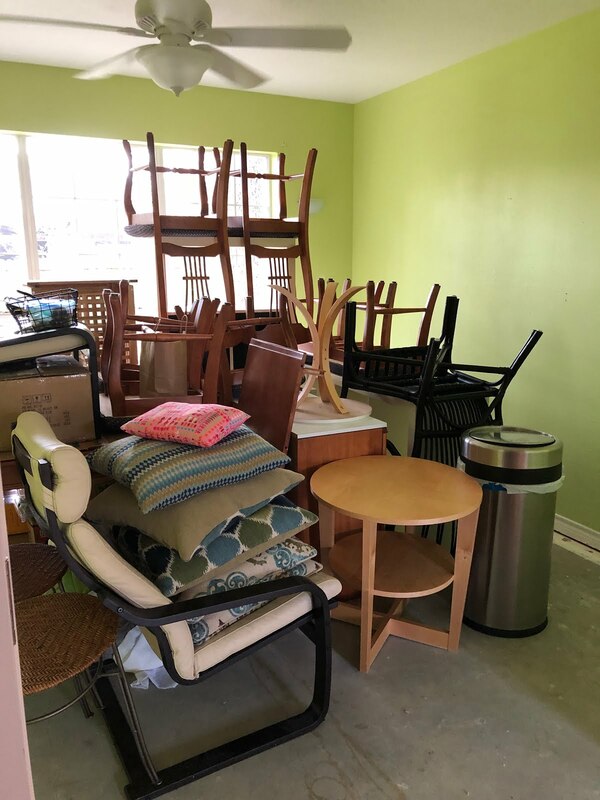 As more time goes by, I'm beginning to be willing to think about redoing our master bathroom - at some point I'll be able to handle the dust and chaos again, right? It looks great! I really love the grey. I think that is my new color for my house as I want to paint all my walls that color! ( but i havent yet). 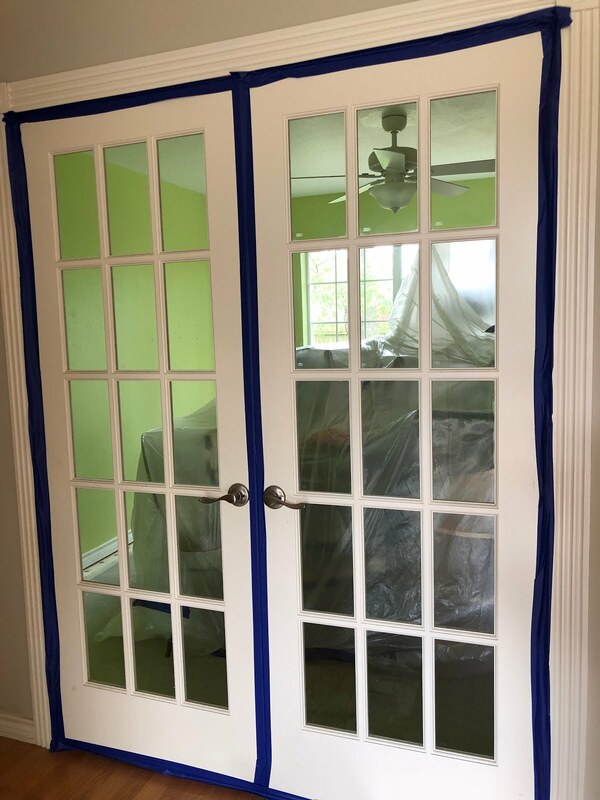 What made you want to remove those lovely French doors? Thank you - I love how the gray walls make the house feel light and cool. I removed the French doors because they were always open, covering the wall on either side of my office (on the outside), and I wanted wall space to hang art. That area feels bigger now without the doors sticking out. I had those green walls for a lot of years and to be honest, some mornings I'm surprised to walk in and not see green, LOL. I love how it turned out! 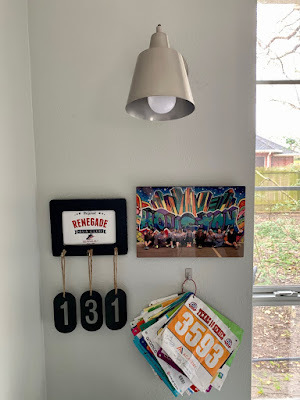 That rug is so fun and I love how you have your bibs displayed! (well, I love how you have your everything displayed). I was going to say how nice it is to have that much light in there from the windows! LOL, good call on the shade. I need that for my office in the summmer! I love it too! 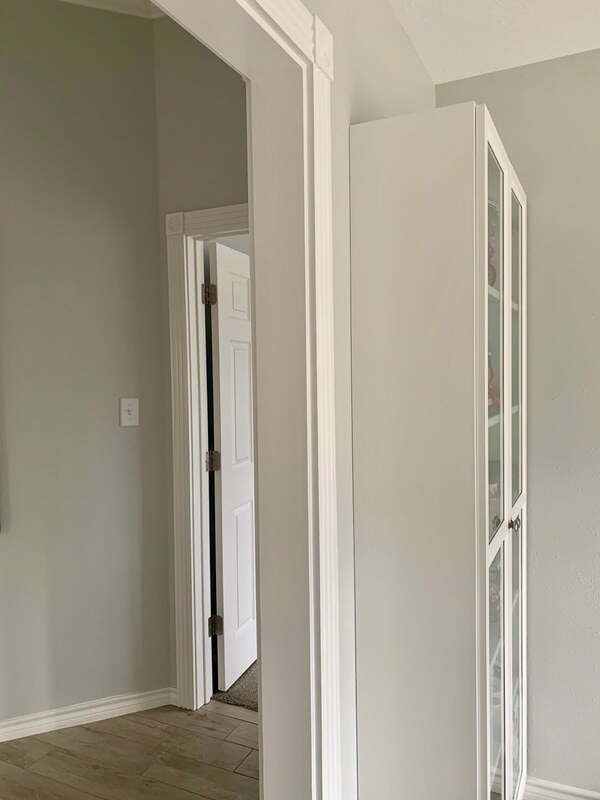 We have French doors, and I would never get rid of them, though! 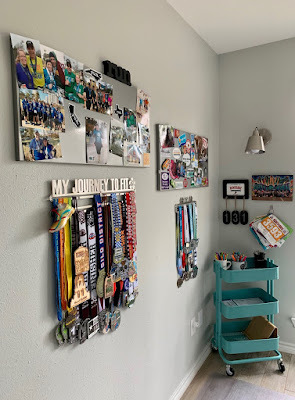 I kept focusing in on the display hooks for your race medals, because I am trying to figure out a cute and easy way to display mine. I'll post close up pictures of the medal racks and where I got them on Friday's mishmash. I LOVE it! The gray walls definitely brighten the room! That rug is neat, too - I've never heard of that! Great job and congrats on the finished product! Please come re-decorate my house!!!!!!!!! My new master bath is grey & white!! I used to collect Barbie Christmas ornaments. I'm trying to de-clutter. Any interest in them?? I wish I could help with your redecorating!! Thank you for the offer of the ornaments but I'm doing the same as you, working on getting stuff out of the house. Bet they would make a cute tree for a special little girl. Really nice job! 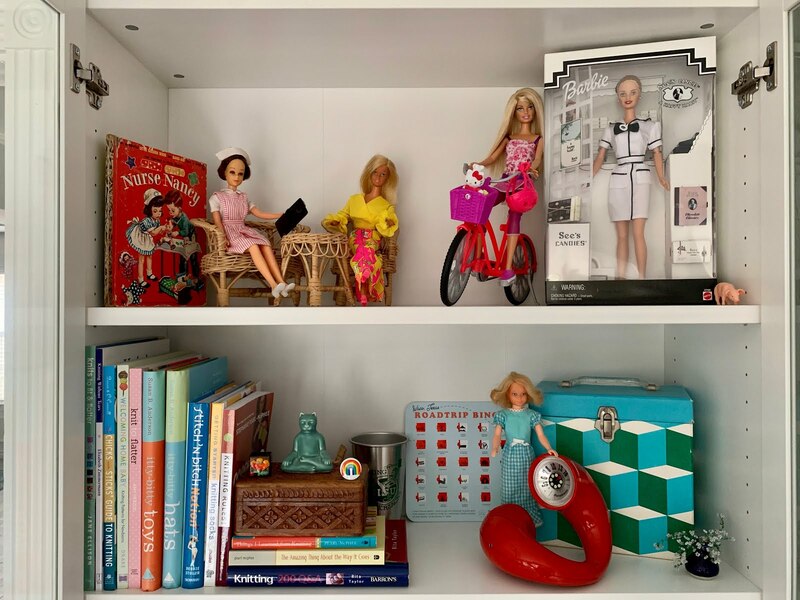 I like the new fillers for your cubby shelves (or whatever they are called). Oh my fabric bins? Yeah, I love them - Target! Looks great! The perfect place to work!!! !